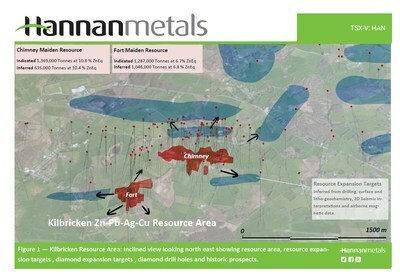 VANCOUVER, July 10, 2017 /CNW/ - Hannan Metals Limited ("Hannan" or the "Company") (TSX.V: HAN) (OTCPK: HANFF) is pleased to announce a maiden resource estimate for its 100%-owned Kilbricken zinc-lead-silver-copper deposit in Ireland. Mr. Michael Hudson, CEO and Chairman, states: "The maiden resource is an important milestone for Hannan. It demonstrates the high-grade potential of the deposit and immediately ranks Kilbricken as one of the top ten base metal deposits discovered to date in Ireland. This is significant initial achievement in a country that is ranked first in the world in terms of zinc discovered per square kilometre since the 1950's. While this resource is substantial, it is also lies open in all directions with excellent potential for expansion. We currently have one drill rig operating a resource expansion program and we will soon be mobilizing additional drill rigs. We are able to approach our exploration and expansion programs with the benefit of extensive technical databases and an increased understanding of the controls on mineralization, providing an excellent chance for continued discovery." To further delineate the underground potential around the current resource area as shown in Figure 1. Drilling is now ongoing within this area and initial drill results are expected within the next three weeks. To date two holes have been completed for 1,365 metres. To test conceptual and advanced exploration targets within 1-5 kilometres defined by recent structural and stratigraphic interpretation of re-processed 2D and 3D seismic data, lithogeochemistry and soil geochemistry as shown in Figure 2. Test for first order mineralization within the 40 kilometre under-tested Waulsortian host horizon that exists within Hannan's 100% owned 32,223 hectares of prospecting licences. Tables 1, 2 and 3 below outline global indicated and inferred resources for each mineralized body as well as a breakdown of resources by location for various lower cut off grades. Figures 1 and 2 show the mineral resource areas, resource expansion targets, diamond holes and historic prospects at different scales. Grades. The 5% ZnEq base case is highlighted. Note:The zinc equivalent (ZnEq) value was calculated using the following formula: ZnEq% = Zn % + (Cu% * 2.102) + Pb% * 0.815) + (Ag g/t * 0.023) with assumed prices of Zn $2587/t; Cu $5437/t; Pb $2108/t and Ag $18.44/oz. The National Instrument 43-101 Mineral Resource estimate was calculated by Mr. Geoff Reed, MAUSIMM (CP), of Reed Leyton Consulting Pty Ltd ("Reed Leyton") from Sydney, Australia. The resource has an effective date of 10 July, 2017. Reed Leyton estimated the Kilbricken Mineral Resource using a drill database of 222 drill holes for 118,000 metres produced by Lundin Mining Ltd, drilled from 2010 to 2012. The resource was calculated using mineralized intercepts from 76 drillholes and a comprehensive re-interpretation of the geology by Hannan. The resource does not include any 2017 drilling by Hannan. A set of cross-sections and level plans were used to construct three-dimensional wireframe models at approximate cut-offs of 1% and 3% ZnEq for both the Chimney and Fort zones. All assays were composited, with a majority composited to two metre lengths, with a minimum half metre length. No upper cut-off was applied to zinc but an upper cut off was used for lead and copper mineralization at the Chimney zone and to lead, copper and silver at the Fort zone. Block model grades within the wireframe models were interpolated in Vulcan by Ordinary Kriging with secondary check models by inverse distance squared. Classic density measurements (specific gravity of "SG") were performed on all samples. Indicated Mineral Resources were defined by at least 2 holes falling within a 30 metres sample distance, with the remainder of mineralization greater than 30 metres sample distance categorized as Inferred Mineral Resources. The base case mineral resources reported above use a lower cut-off grade of 5% ZnEq or approximately US$60 per tonne net smelter return value based on potential underground mining scenarios. The zinc equivalent (ZnEq) value was calculated using the following formula: ZnEq% = Zn % + (Cu% * 2.102) + Pb% * 0.815) + (Ag g/t * 0.023) with assumed prices of Zn $2587/t; Cu $5437/t; Pb $2108/t and Ag $18.44/oz. Equivalent recovery for all metals is assumed. A metallurgical gap analysis was performed for Hannan and reported on 30 March 2017, by Dr. Kurt Forrester of ARN Perspective Ltd, based on a report by SGS Mineral Services, Lakefield Facility, dated September 2010 and titled: "An Investigation by High Definition Mineralogy into the mineralogical characteristics of Fourteen Rock Samples from A Carbonate Hosted Base Metal Deposit, Ireland, prepared for Lundin Mining Exploration". The key finding, based on available information, is that it is likely a conventional lead-zinc flotation circuit at Kilbricken would achieve saleable mineral concentrates. Therefore, it is assumed that lead and silver will be recovered in a lead concentrate, and a separate copper circuit may be required. The Kilbricken project lies within the Clare zinc-silver-lead-copper property which consists of 9 prospecting licences ("PLs") for a total of 32,223 hectares. The project is in County Clare, Ireland, the western edge of which lies 1.5 km east of the town of Ennis. The Property is underlain by an Upper Devonian to Lower Carboniferous sequence of sandstone and limestones. The stratigraphy appears simple, where units are upright and typically of consistent in thickness across the property. Syn-rift and/or later structures appear to complicate the geological framework, particularly in mineralized areas. The Lower Carboniferous sequence includes the Waulsortian Limestone, which hosts most of Ireland's important zinc-lead sulphide deposits, such as the Lisheen (pre-mining resource 18.9 Mt @ 15.0% Zn+Pb) and Galmoy (pre-mining resource of 6.2 Mt @ 12.4% Zn+Pb) deposits. This data has been sourced from the Irish Exploration, Mining Division website http://www.mineralsireland.ie/. Two mineralized bodies are present at Kilbricken, the upper Chimney Zone and the lower Fort Zone. Both show an association with NW-SE striking extensional faults. The Chimney Zone, being the initial discovery area, has been most intensively drilled within an area of 750 metres by 200 metres, between 440-530 metres below surface and averages 12 metres thickness. Mineralization is controlled by a failed relay ramp between two extensional fault segments. It is stratabound at the base of the Waulsortian limestone. The Fort Zone was found later in the Lundin program and is drilled over an area of 400 metres by 200 metres, between 480-720 metres below surface with an average thickness of 40 metres. The mineralized body is wedge shaped and transgressive to the host rock. It follows an area of extensive dissolution of the host limestone and structurally it is located adjacent to the zone of maximum displacement of a south dipping extensional fault. Qualified Person – Mineral Resources: The Mineral Resources disclosed in this press release have been estimated by Mr. Geoff Reed, MAUSIMM (CP), owner of Reed Leyton Consulting Pty Ltd and independent of Hannan Metals Ltd and have an effective date of 10 July 2017. By virtue of his education and relevant experience, Mr. Reed is a "Qualified Person" for the purpose of National Instrument 43-101. The Mineral Resources have been classified in accordance with CIM Definition Standards for Mineral Resources and Mineral Reserves adopted by the CIM council on May 10, 2014. Mr. Reed, MAUSIMM (CP), has read and approved the contents of this press release as it pertains to the disclosed Mineral Resource estimates.